The kids are doing great. 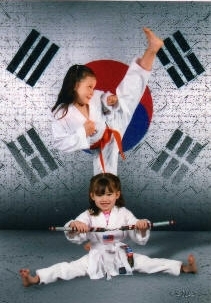 Since the picture was taken Ally has received her yellow belt. Ashli (giant slacker) is still an orange belt. Ashli started her new school on July 22 and it is a lot tougher than normal schools. We met the teacher and she told us what the kids will be doing this year. They are going to really push the kids at this school. They have to do a book report every week! Ally is jealous because she wants to go to school too. August, 5 was her 4th birthday and she is mad that she didn't get a pink Nintendo DS. They both spent the night at a friends house last night. This is Ally's first real slumber party and she was excited to go. great pic! they're adorable.what kinda school is it? is it like one of those magnet schools? they're growing up so fast! thanks for the update. :) hehe. Yeah, it is a charter/magnet school. She had to take a really long test for an interview. If they don't think she is cutting it, she is out.